Bethany coach Keith Ferguson challenged his team’s fight after back to back losses earlier this week. Tonight, his team responded in a big way with a 61-58 win over Oklahoma Wesleyan in Lindsborg. Oklahoma Wesleyan scored the first basket of the contest, but Bethany countered with a 10-0 run to take a 10-2 lead early in the first quarter. The Swedes’ Erin Richardson knocked in a left wing three-pointer at the buzzer, and Bethany led 18-11 after one. The second quarter turned into a bloodbath, with physical play on both ends of the floor. Led by sensational sophomore Danae Goodwin’s 13 first half points, Oklahoma Wesleyan trimmed the deficit to five at the break, 29-24. Bethany started to pull away in the third stanza. Bethany’s Kelsi Mueller knocked down a pair of free throws to give the Swedes their first double-digit lead with 4:41 to go in the third, 39-29. The lead swelled to 13, 45-32, after Richardson banged through another three pointer with 2:56 left in the period. Oklahoma Wesleyan wasn’t going away in the fourth quarter. The Eagles outscored Bethany 13-5 in the first five minutes of the fourth, and held a 56-53 lead after an Amanda Hart layup. Bethany’s Sena Atkius tied the game with a trifecta at the 2:56 mark. The Swedes then hit 2-4 from the foul line on their next two possessions, reclaiming the lead. After OKWU tied it again, Bethany senior Sarah Bartel wiggled inside for a bucket with 1:30 to go, pushing Bethany’s lead to 60-58. 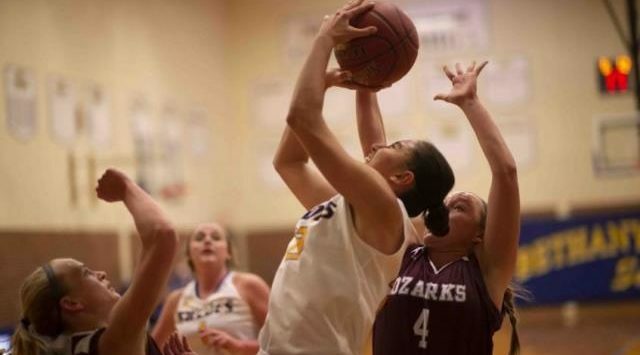 Bethany added a free throw to escape with a 61-58 win. The Swedes held Oklahoma Wesleyan scoreless in the final 1:58 of the contest. The 4th ranked team in the nation remained perfect, as Oklahoma Wesleyan thumped Bethany 89-68 in the nightcap. Five players scored in double figures for the Eagles, led by All-League guard K.J. Malveau’s 15 points. Bethany was led by senior guard Tyler Larkin, who finished with 25 points for the second consecutive game. Bethany had won two straight KCAC contests prior to tonight’s loss. Bethany will look to bounce back on Wednesday at Bethel, with pregame at 6:45pm on KVOB 95.5 The Rock.